The Cynosure SmoothShapes laser system is the ultimate cellulite and body shaping solution for your cosmetic practice. 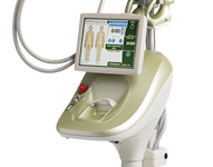 The SmoothShapes system utilizes its own Photomology® technology to deliver an effective combination of vacuum and massage through the use of both light and laser energy. By using highly targeted and consistent tissue temperature elevation, the SmoothShapes system treats the underlying causes of cellulite, working to break up lipids by penetrating cell membranes. The comfortable hand piece includes contoured rollers to help move excess fat and fluids into the lymphatic system for natural draining. This powerful and safe thermal treatment results in a dramatic reduction in the appearance of cellulite safely and painlessly. The Cynosure SmoothShapes is perfect for patients who are seeking the fastest and safest way to look younger, loose inches and get rid of embarrassing cellulite. The system utilizes easy to use, one-setting treatments for the most consistent and reliable patient experience. It’s the ultimate tool for helping clients get rid of cellulite and achieve the smoother skin they’ve always wanted. Interested in adding the Cynosure SmoothShapes laser system to your practice? The SmoothShapes system is the perfect addition to any busy cosmetic practice looking to expand its service offerings to include safe and effective cellulite and skin rejuvenation treatments. SunrayLaser.com has amazing deals on used Cynosure SmoothShapes laser systems with savings that are up to 60% off the original price! See for yourself how much you can save on high quality cellulite removal equipment like the SmoothShapes and other used laser equipment when you buy from SunrayLaser.com. If you are looking for pricing information on a pre-owned Cynosure SmoothShapes system, fill out the contact form below and we’ll send you a free, no obligation quote.